Got questions on how to feed a cat? We’ve got insight on dry food vs. wet food, free feeding vs. meal feeding, what to do if your cat won’t eat — and more. Free feeding might not be the best option in a multi-cat household. Photography ©kozorog | Thinkstock. One of the biggest debates when it comes to how to feed a cat is free feeding vs. meal feeding or scheduled feeding. Free feeding is filling your cat’s dish and leaving it out all day for grazing purposes. This method is fairly common among cat parents because they don’t have to worry if their cats are hungry — there’s always a snack available. It works best with dry food, which holds its freshness longer than wet food does. There are, however, a few downsides to this method of how to feed a cat. In homes with multiple cats, there’s a chance of one cat eating most or all of the food, leaving the other one with less or even no food. Obesity is also more likely when cats are given free reign over their food intake. Scheduled feeding or meal feeding is feeding your cat a certain amount of food at regular times during the day. This type of feeding is usually done with wet food and is often used when a cat needs to eat a prescribed amount, sometimes for weight-loss reasons. Cats are instinctual hunters, which means they are used to eating a few small meals a day. Scheduled feeding mimics this more closely than free feeding. Some cat parents combine free feeding and scheduled feeding. Dry cat food vs. wet cat food — which is best? The next source of debate when thinking about how to feed a cat deals with wet or dry cat food. There are many opinions regarding what type of food is best to feed your cat. Cats are obligate carnivores, so it makes sense that a high-protein, low-carbohydrate food is the best fuel for kitty. In addition to the wet cat food vs. dry cat food debate, some cat parents choose to feed cats a raw food diet, giving their cats the same sources of nutrition they would receive in the wild. Whatever the variety, it’s always important to check ingredients when shopping for cat food. Another question commonly associated with how to feed a cat is — what do you do if your cat isn’t eating? There may be several reasons why your cat isn’t eating. If you’re changing food brands or types, it’s best to introduce the new food gradually. A sudden change could definitely cause kitty to turn her nose up at her meal. Slowly begin to mix the new food into the one your cat is accustomed to eating until she’s completely switched over to the new food. 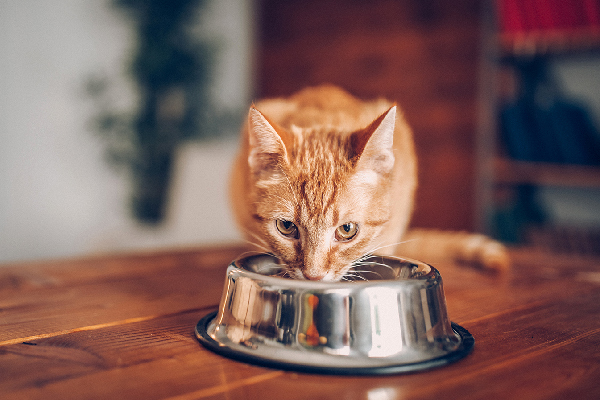 If a cat refuses to eat due to stress like moving or the addition of a new pet or human to the household, you could try hand-feeding her a little to stimulate her appetite. You could also experiment with warming her food to room temperature or adding a little broth or gravy mixed with the dry food. People may joke about their finicky cats, but if your cat has not eaten for 24 hours, it’s time for a veterinary exam and consultation. Loss of appetite may indicate serious health conditions like kidney failure, intestinal issues, pancreatitis and cancer. It could also indicate that your cat has dental issues that need addressing. Where should you feed your cat? The next dilemma with how to feed a cat — where to feed your cat. If possible, choose a quiet location to feed your cat and place the food dish away from the litter box and cat bed. Cats enjoy a calm, safe dining environment, away from stressors like loud noises or other animals. 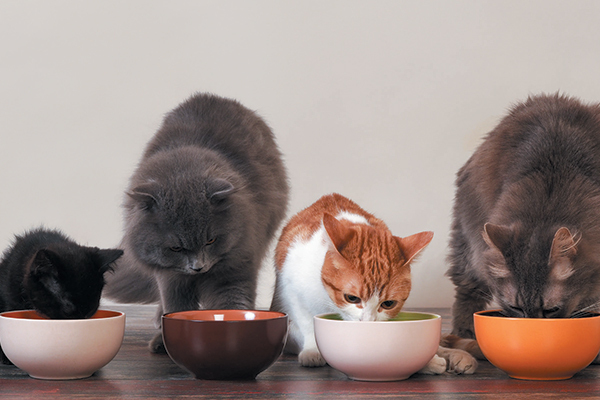 In fact, if you have multiple animals in your home, don’t place their food dishes beside one another — they prefer their own space when it comes to mealtime. This is true even if the two pets in your household are both cats. Is there really a “right” way to feed your cat? When it comes to how to feed a cat, each cat is an individual with her own preferences. However, you can follow some of the basic guidelines mentioned above to create a positive experience when feeding your cat. As always, consult your vet with any issues concerning behavior or health. Tell us: What works for you when it comes to feeding your cat? What are your tips on how to feed a cat? Thumbnail: Photography © eclipse_images | E+ / Getty Images. This is some really good information about how to feed a cat. I want to get a kitten this summer. However, I have never owned a cat before. So, I liked that you explained that I just need to make sure that my can is getting essential amino acids in his diet. That is good for me to know as a new pet owner. I never see my cat drink water from her dish? So I add a small teaspoon of water to her wet food? Puzzled? My sweetheart ???? eats blue buffalo chicken and brown rice 1x in the am and 1x in the evening. She’s just 14 months old. Wet food vs. dry? Read “Your Cat” by Elizabeth Hodgkins. Dry food does not have enough protein and has too many carbs. At first glance, it may appear as though dry food has more protein (30-40% vs wet 7-11%), but once you compare them equally by factoring in the water, you will see that wet food has more protein and less carbs. How do you do this? Use 100% as the starting line for both wet and dry. Subtract the protein, fat, fiber and moisture. What is left is carbs. Taurine isn’t an amino acid it’s a sulfonic acid. Whenever taurine is mentioned in conjunction with cats it’s always a good idea to point out that taurine is almost completely absent from tuna and that it is therefore a very bad idea to make (human grade) tuna a regular component of a cat’s diet. And before people mention that tuna wet food is available, wet foods typically contain only 4% of the named ingredient, with the rest being mystery stuff. Enough named ingredient so that it smells like it (and maybe even tastes like it) but the rest is cheaper meat/vegetable protein/carbohydrate. So tuna cat food is OK, tuna for humans is not (except as a very rare treat). My sweetheart ???? ???? eats nothing but blue buffalo chicken and brown rice dry food i get it every month 1x a month maybe 2 x a month she ??? ?s her dry food she eats 2 x a day the morning and then in the evening.